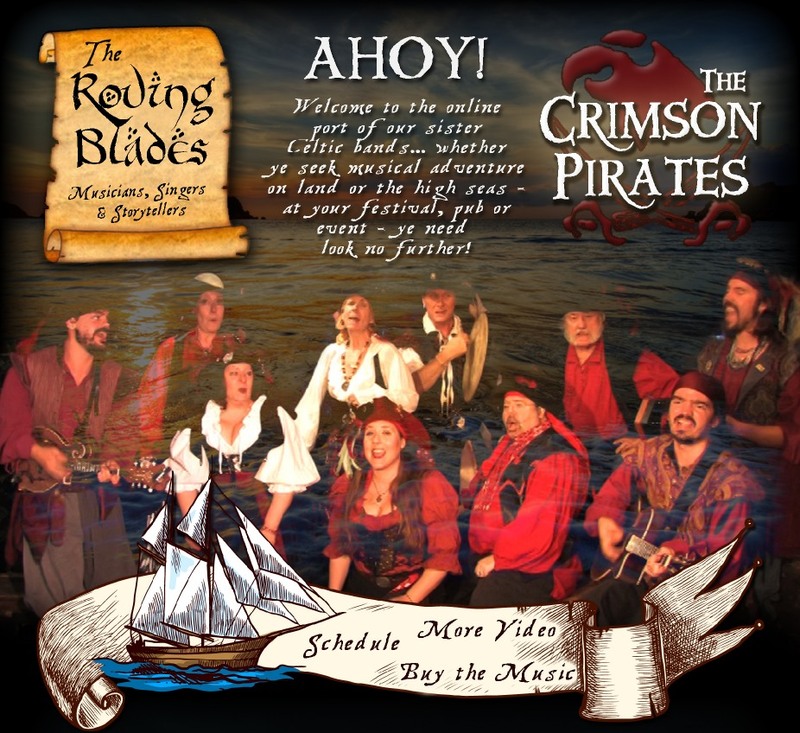 The Roving Blades and Crimson Pirates are a high-energy crew of singer/instrumentalists who have been performing Celtic and maritime music together for over 22 years. 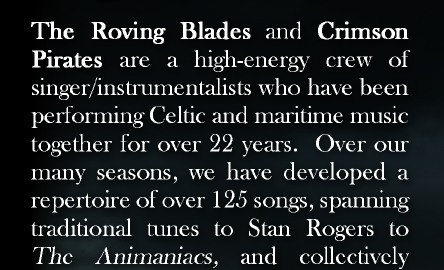 Over our many seasons, we have developed a repertoire of over 125 songs, spanning traditional tunes to Stan Rogers to The Animaniacs, and collectively recorded 11 albums of Celtic music. 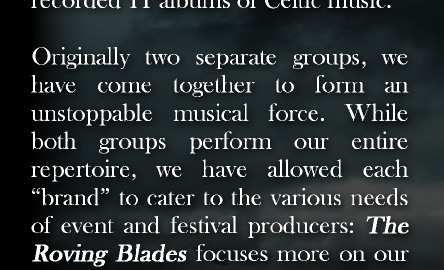 Originally two separate groups, we have come together to form an unstoppable musical force. 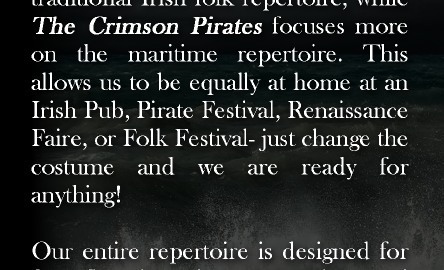 While both groups perform our entire repertoire, we have allowed each “brand” to cater to the various needs of event and festival producers: The Roving Blades focuses more on our traditional Irish folk repertoire, while The Crimson Pirates focuses more on the maritime repertoire. This allows us to be equally at home at an Irish Pub, Pirate Festival, Renaissance Faire, or Folk Festival- just change the costume and we are ready for anything! Our entire repertoire is designed for four, five, six, or larger groupings, and we are well-versed in tailoring our cast and set lists to suit any event and any producer's needs and budget. We also often tour with Off Broadway’s improvised, interactive musical, The Greatest Pirate Story Never Told! 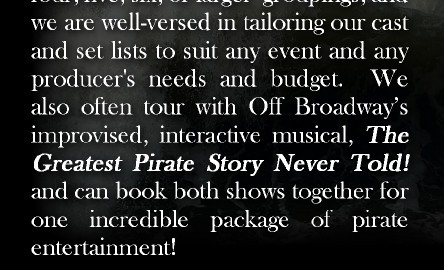 and can book both shows together for one incredible package of pirate entertainment! The New York Renaissance Faire (Tuxedo, NY), The Bristol Renaissance Faire (Kenosha, WI), The Original Renaissance Pleasure Faire (Irwindale, CA), The Colorado Renaissance Festival (Larkspur, CO), The Pittsburgh Renaissance Festival (West Newton, PA), The Florida Renaissance Festival (Deerfield Beach, FL), The Pennsylvania Renaissance Faire (Manheim, PA), The Scarborough Renaissance Faire (Waxahachie, TX), The Pirates in Paradise Festival (Key West, FL), The Midsummer Fantasy Renaissance Faire (Ansonia, CT), The Medieval Festival at the Cloisters in Fort Tryon Park (New York, NY), The Staten Island Medieval Faire (Staten Island, NY), The Stockwood Renaissance Faire (Hurley, NY), The Park City Renaissance Faire (Bridgeport, CT), The Redland Renaissance Faire (Homestead, FL), The Long Island Pirate Festival (West Sayville, NY), The Bayonne Renaissance Festival (Bayonne, NJ), The New York Capital District Renaissance Festival (Altamont, NY), The Land of Enchantment Festival (Morrisville, PA) and The Blackbeard Pirate Festival (Hampton, VA).